We all thought that once the sun came out and that poor spider climbed the spout again, her troubles were over! Guess again! 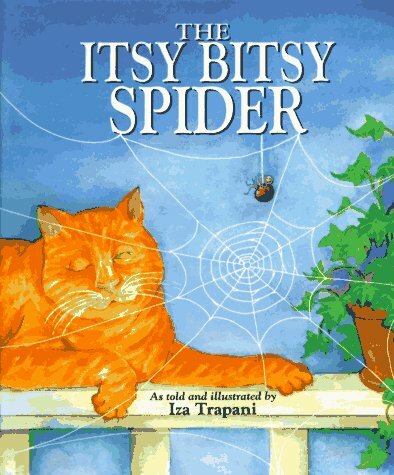 This miniscule spider has many more misadventures in this cleverly adapted rendition by Iza Trapani. Iza Trapani has added her own touch to a well-known classic. And what a touch it is. This tiny arachnid is thwarted at every opportunity by elements beyond her control. She does battle with an electric fan, a mouse, a cat and some dew. Yes, I said dew! But there is a delightful and appropriate ending to all of this mayhem. The glorious scenery and creatures in this book are captivating. You can almost feel the heat from the sun shining through the window . The colors are soft and inviting. I recommend this book for even the very young. And for those of us who still love a good nursery rhyme or even a variation of a rhyme! It is a pleasure to revisit an old friend and to introduce ourselves to the new (but soon to be favorite) verses created by Iza Trapani.